Lightning surge overvoltage cause by shielding failures or black flashover events which are transient in nature, being 80-90% of overhead line faults. Conductor mechanical failures resulting from creeps, vibrations, joint and fitting fatigue. Pollution of insulators by salt, conductive dust, cement dust and other chemicals. Projectiles and bush fires etc. Support structure failures caused by storms etc. Accidental contact which refers to damage caused by excavation operations either resulting in immediate failure or minor damages such that some considerable time may elapse before insulation fails. Insulation failure due to ingress of moisture, loss of dielectric impregnant and internal ionization (partial discharge). Faults in joints and terminations. Overloading resulting in overheating and thermal run-way. Phase to phase faults in windings. Overheating due to overloading or failure of cooling system. Tap changer faults and mechanism failure. Leakage of insulant i.e SF6 gas or low oil. Salt, conductive dust, cement and other chemical pollutions on outdoor switchgear. Accidents resulting from human error, phase to earth faults. Bridging of air gaps by animal etc, phase to phase faults. Equipment failure causing busbar faults. Flashover usually phase to phase faults. They can be caused by overvoltage due to transient, lightning and switching surges or sudden loss of load and insulation deterioration. Single phasing i.e. operation of motor with only two effective phases connected due to a blown fuse or open circuit winding. Phase to earth faults on windings and connections. Phase to phase faults on windings and connections. 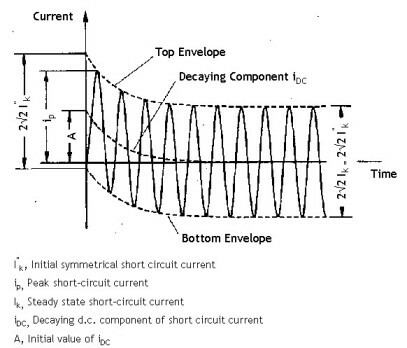 Phase to phase and phase to ground faults. Overspeeding of generators due to load rejection.